Lofty principles, sacred promises, the public interest, the Constitution, and democracy itself are at stake in a heavyweight bout between El Comercio and La Republica. The dispute is about which of them should control Correo and Ojo, two of Peru’s biggest and best newspapers. The fight is, of course, about money and power. Today in Peru, unusually, circulation is much bigger and more valuable than ever before. Peru is in the run up to a wide-open presidential election in 2016 and this is one of the first big skirmishes of the campaign. Amazingly, in the electronic age, Peru is a fast-growing, feisty newspaper market. Millions of unlettered 20th century families have morphed into 21st century householders and straphangers. The straw shacks of two and three decades ago are today brick and cement and not just in Lima but in Arequipa, Ica, Chimbote, Trujillo, Chiclayo, and Piura. While The Washington Post has had to be rescued by an electronic biz kid who probably doesn’t touch a newspaper from one week to the next, El Trome – El Comercio‘s zappy down-market tabloid – has tripled its circulation in just five years to 650,000. It is read by the new commuters, including the chauffeurs and maids of the people who read and advertise in the Establishment’s El Comercio. El Trome is read by one in three newspaper buyers in Peru. This is over three times more than the numbers who read the company’s flagship El Comercio (94,000) together with its less turgid stable mate Peru21 (87,000). In Peru, each copy has a readership of perhaps four or five. The Internet has a still-low penetration of around 25%. There are, or rather were, three Big Newspaper groups in Lima. These are, or again were: El Comercio, the tough, rich Establishment leader; La Republica, the left wing group; and the Agois-Banchero group’s middle-of-the-road Epensa, featuring Correo and Ojo. Today, Epensa is just a nameplate. In July, La Republica’s financial backer, Salomon Lehrner, had quietly arranged to buy out the Agois’ 93-year-old major Epensa shareholder, with 54%, for $17.2M, a bargain. In August El Comercio muscled in at the last minute with $18M, including an $800,000 pourboire for Apoyo, its bankers. Still, a giveaway. They got the deal. Overnight, El Comercio’s share of Peru’s newspaper market went from around 50% to 80%, more than that of Beijing’s The People’s Daily. Here, in this case, notwithstanding the adage to the contrary, otorongo no come otorongo, as things stand, El Comercio – more, an anaconda than a quick-footed mountain lion – has swallowed, in a single cheap gulp its only competitors, market leaders Correo and Ojo, both of them livelier and more market-friendly than its own products. This is not good for the newspaper business in Lima. It is, in fact, a disaster. It gives the Comercio group four out of every five newspapers, and the deal would have been unhesitatingly thrown out of Anti-Trust court anywhere in Europe or North America. Anywhere, indeed, this side of Iran. Even Pravda Granma never had 80% of the market. Correo’s market is A and B, Ojo’s is C and D. Correo and Ojo have been growing, fast. Ojo, a feisty tabloid has doubled its circulation lately to 300,000 Correo is, at 155,00 and growing, easily the market leader in the A and B level, triple that of La Republica, (45,000), the left wing tabloid. Leaving aside for a moment the unfortunate readers, advertisers today have a choice of ONE. As Henry Ford liked to say: you can have any colour you like so long as it’s black. Journalists who don’t see eye to eye with the numerous Miro Quesada family, El Comercio‘s patriarchal owners, will be out of luck and a job. Politicians who don’t get the nod from the Miro Quesadas will be in the same boat, offshore and heading west. The Miro Quesadas say they will not interfere in the journalistic side of Correo and Ojo. As we used to say in Fleet Street, “pull the other one, it’s got bells on.” Rupert ‘The Dirty Digger’ Murdoch, my old employer, said the same when, in London, he bought The Times, The Sunday Times, The Sun, The News of the World and, in New York, The Wall Street Journal, among a hundred others elsewhere. Today his people, courted and employed by every prime minister since Margaret Thatcher, are being sent to jail in London for behaviour disgraceful even by Fleet Street’s flexible standards. The Miro Quesadas are the cholo version of the Murdoch tradition, memorably cartooned as Lord Copper of The Daily Beast in Evelyn Waugh’s classic Scoop. For decades the Miro Quesadas carried on a deadly vendetta against the big up-the-workers AAPRA party and have enthusiastically backed every golpe militar within living memory. They helped oust President Belaunde’s democratic government in 1968. Velasco’s military whipped round and nationalised El Comercio as well as the other dailies. Belaunde, a gentleman, returned El Comercio to the Miro Quesadas the day that he returned- to the Government Palace in 1980. Today’s El Comercio, with its bland, deviously cryptic front pages, is a well-established formula in Latin America, like the Edwards family’s El Mercurio in Santiago and their equivalents in Buenos Aires and Ciudad de Mexico. A rich, sad bunch of Little Murdochs. The Miro Quesada newspapers do a poor job of reflecting the realities of Peru, one of the world’s most varied, fast-moving, and fascinating countries. La Republica’s journalistic tradition is a little better, but not much. It was, for instance, anti-Fujimori i.e. anti-political gangsterism. But it has been quiet about the vote-rigging, phony finances, and corruption associated with Presidents Toledo and Humala, its political friends. Salomon Lehrner, a La Republica financial angel, has been a backer of Toledo and Humala and has built up a colourfully disreputable financial reputation, outlined more than once in Correo, over the past few decades. 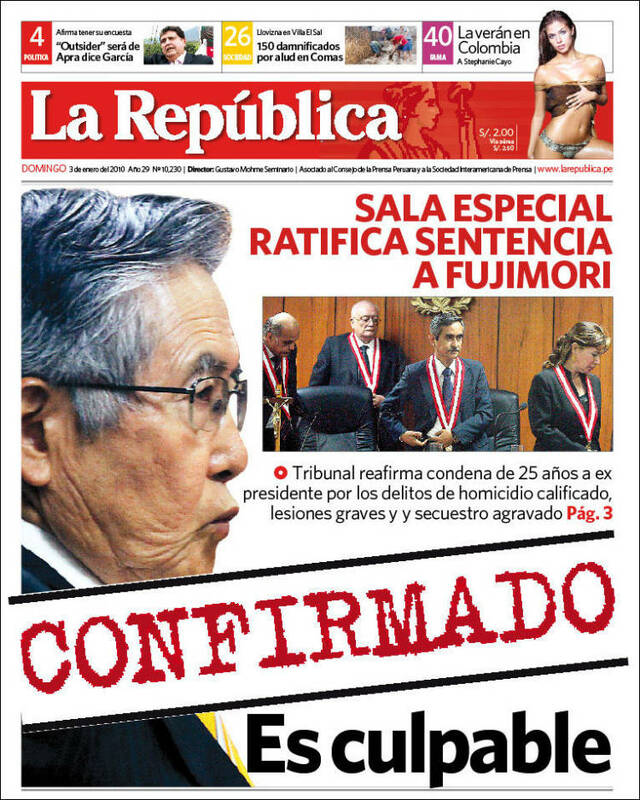 However, La Republica, an attractively laid out full-service tabloid, is at least livelier than El Comercio. Circulation figures show, however, that it is a poor representative of the 50% of voters who regularly place their confidence in populism, which is what’s left, as it were, of the Socialism of the long-gone 20th century. It is, in the A & B range, outsold three-to-one by middle-of-the-road Correo. 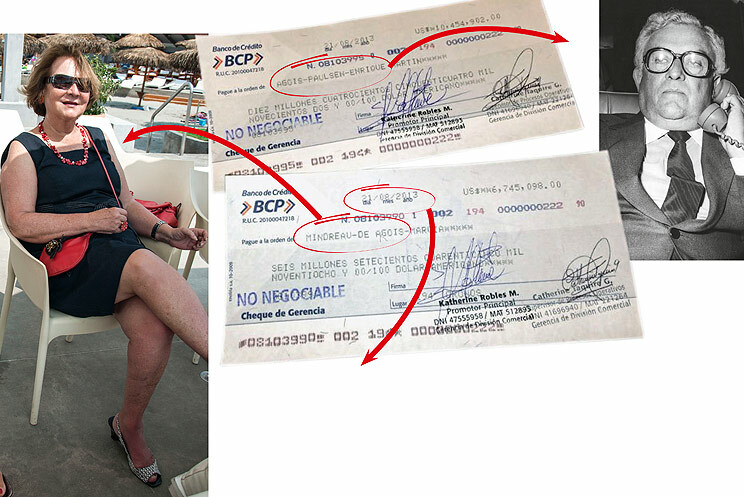 It was Correo, for instance, that broke the US$50M Toledo scandal: this features a bankrupt Israeli-Peru financier Josef Maiman, with whom Lehrner has worked closely in the past. Lehrner helped finance Humala’s campaigns in 2006 and 2011 and was Humala’s prime minister for the government’s first months. Curiously, El Comercio and La Republica are partners in the market-leading TV Channel 4, El Comercio with 70%. This has been returning annual profits of between $15 and $20M, important to La Republica’s cash flow. Gustavo Mohme, La Republica’s publisher, is a well-established construction figure. El Comercio is associated with Grana y Montero, Peru’s top construction company, quoted since 2013 on the NYSE. La Republica is understandably upset about losing the Epensa deal. which Lehrner had engineered through a backstreet notary in the no-go Lima district of Puente Piedra. But La Republica’s directors would never have kept their left-wing fingers off middle-of-the-road Correo and Ojo. People with a political agenda, left, right and centre are boring and newspaper readers everywhere, of course, know it. 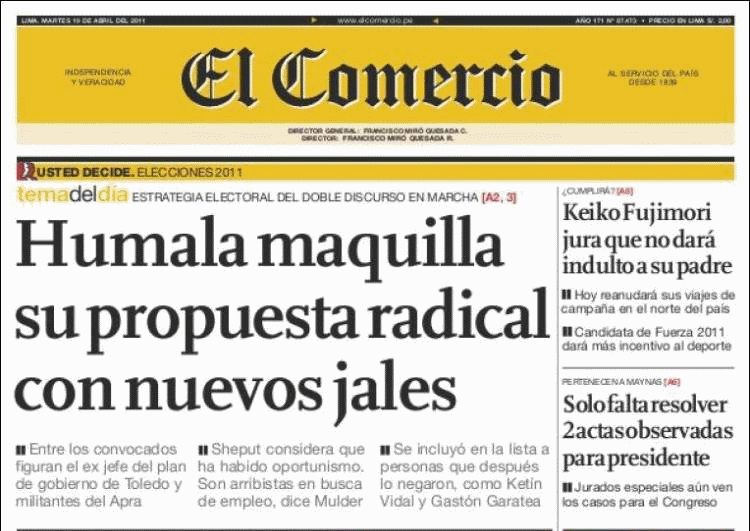 El Comercio will surely be told by even the most susceptible magistrates. that their protestations of good faith are meaningless, even if they claim that they are nice-guy reformed characters. The magistrates will, we can hope, crossing our fingers, tell them that they have to sell their new prize, but will tell La Republica that they cannot be the buyers. President Humala has weighed in on the TV, saying that the purchase of Epensa by El Comercio, “an octopus,” is in every way wrong and that he is drafting a press law. Lehrner and others have chimed in but this would, as we all know, make things worse. The answer is to tidy up Peru’s well-intentioned but confused anti-trust legislation. All that’s needed is to copy the European Union legislation, already in Spanish, under which corporate fusions must be routinely cleared by the regulators, in this case Indecopi, which often works quite well. Nicholas Asheshov, Editor for many years of the Peruvian Times and The Andean Report, worked on Fleet Street for Lord Rothermere’s Daily Mail, Rupert Murdoch’s Sunday Times and for the Financial Times, and Institutional Investor. 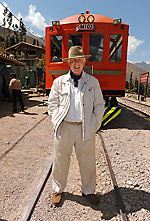 He lives in Urubamba and in 2010 broke Orient Express’s Peru Rail Machu Picchu monopoly.